Unemployment among youth is raging at a staggering 26 per cent to 55 per cent in the three BJP ruled states going to polls in the coming weeks. High and pervasive joblessness among youth of age group 20-29 years is severely denting the re-election prospects of BJP in Chhattisgarh, Madhya Pradesh and Rajasthan. According to data from CMIE’s Statistical Profile for May-August 2018, unemployment rate was 26 per cent in Chhattisgarh, 30 per cent in MP, and a shocking 55 per cent in Rajasthan among the youth in the age group of 20-29 years. This is reflected in unemployment among graduates – over 14 per cent of graduates were without jobs in Chhattisgarh, with the corresponding numbers being 8 per cent in MP and 21 per cent in Rajasthan. CMIE conducts surveys across all states, covering a sample of about 1,73,000 households having 5,22,000 members of age 15 years or above. The figures given above refer to share of persons who are unemployed, but are willing to contribute to the total labour force. It includes those actively looking for work and also those who, though willing, are not actively looking for work. Unemployment among women too shows a much higher level in all the three states ranging from 8 per cent in Chhattisgarh through 17 per cent in MP to 53 per cent in Rajasthan. Recent poll surveys confirm that unemployment remains the top issue on voters’ minds in all the states. According to Lokniti-CSDS pre-election survey published on November 8, lack of jobs was the top issue reported by surveyed people from all three states. The second biggest issue was also economic – price rise. Taken together, these two issues were noted as the biggest issues by 41 per cent people in MP, 43 per cent in Rajasthan and 40 per cent in Chhattisgarh. 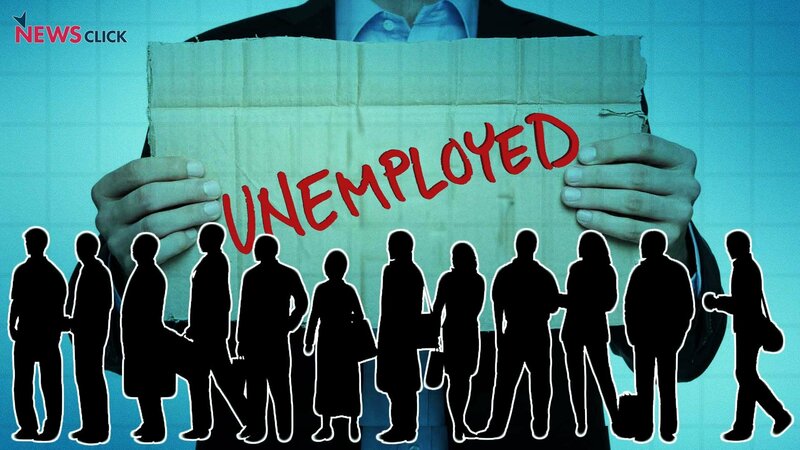 Earlier, in May 2018, a Mood of the Nation survey done by Lokniti-CSDS too had found that 57 per cent of people surveyed said that it had become more difficult to find jobs in the area. This share of discontented people was more than that in earlier such surveys. Again, lack of jobs and poverty were identified as the two biggest problems faced by people. In this situation, and with continuing jobs crisis, it is not surprising that people will blame the BJP government in the respective states – and also the Narendra Modi led central government – for this sorry state of affairs. This is especially so because Modi-led government at the Centre, and his colleagues in the three states had won the previous elections by promising jobs. Remember the famous Modi promise of 1 crore jobs every year made during the 2014 election campaign? In MP and Chhattisgarh, BJP has been in power continuously for three terms, and cannot escape the fact that it has determined policy for a fairly long time. Handing over of natural resources to private sector, displacement of people through land grab for projects, cuts in government spending, etc. have created stagnation in job growth. In Rajasthan, it has been the incumbent for five years, but has aggressively pushed the same neo-liberal agenda of privatisation, labour law reforms, contractualisation, outsourcing of services, cuts in government spending, etc. that has led to sky-rocketing joblessness. The dire jobs situation among the youth, notably among educated youth, is particularly damaging the BJP’s election prospects because these were the sections that were most enamoured of Modi and BJP five years ago. His promises had been swallowed hook, line and sinker by the middle class which labours under the illusion that globalisation and liberalisation are the road to prosperity. Five years of these policies, implemented with a gusto and aggression that the Congress itself could not muster in its rule previously, has shattered these illusions. Of course, this doesn’t mean that everybody will vote against BJP, but the drift away from the saffron party will damage its tally seriously.